Brixton 1988 by unknown artists. Co-Seal Paint. Winged dogs and seaside scenes are a surprise for visitors to Brixton! Having successfully worked with local residents of Bellefields Road in 1987 to create one mural, the London Wall Mural Group were asked back to do a second piece. This was to be located on another gable end close to the the first mural. Residents of the area were consulted about the content for this piece. It was agreed that the colour scheme should match the first mural. This time the scene created was that of an abstract beach. In the top three quarters, there is a partially sandy and partially rocky beach, then white foam which meets the blue sea. Off the shore to the right, is a small rocky island. Past that is a blue sky with abstract sunset and pink rays. In the foreground on top of a rock, stands a winged dog. The artists of London Wall spent much time creating the composition for the design and making sure that the local community had their input and were happy with the outcome. There was some setbacks when part of the scaffolding was stolen. Aside from that, the mural was painted over four months by two local artists, Eugene Palmer and John Saward who took over that part of the task from the London Wall Mural Group. Funding for the piece came from Lambeth Council, Greater London Arts and BP. 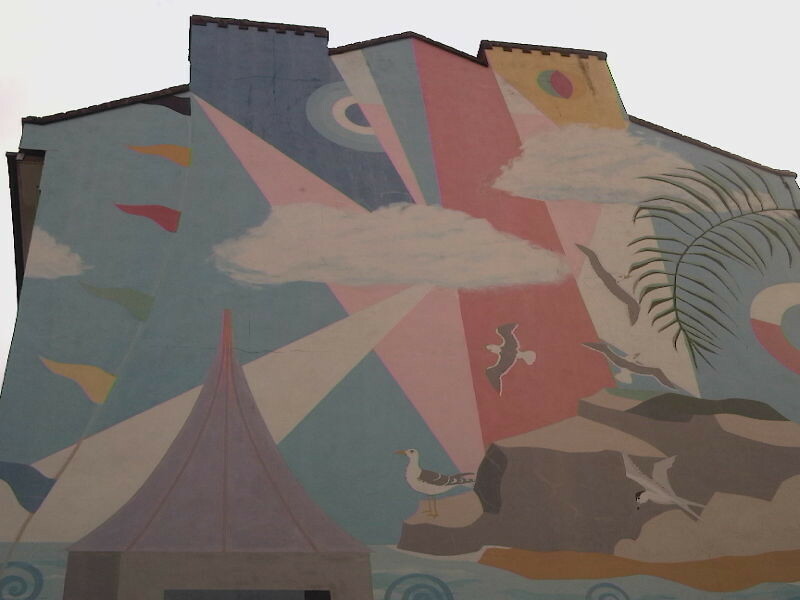 Much of the mural is still in good condition, however vandalism has led to the bottom part being destroyed. Perhaps one day that can be tidied up and the mural cleaned so that it will last for another 20 years. The bottom quarter has been painted over with grey paint and is completely obscured. This was due to graffiti vandalism.The mural has faded and there are some crack lines in the render. Wall condition is okay. There are no leaky downpipes but there is a chair anchored to the wall 4/5s of the way up and this has caused some rust colouring below the anchor point. Turn right from Brixton Tube station. Turn off into Stockwell road and take the first left into Bellefields Road opposite the Brixton Academy. The mural is a just a few metres in on the right hand side.